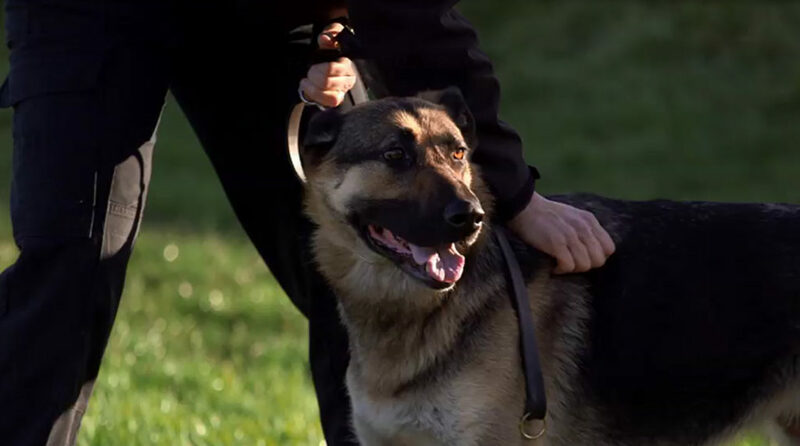 A police officer comes to Noel as a last hope for her work partner- a four year-old German Shepherd police dog called Anya. The pair have been a team for two years, fighting crime, and protecting each other along the way. Anya is not only a working dog, but lives at home with her handler and they share a close and formidable bond. However, the partnership is threatened by a burst disc in Anya’s spine causing her agony, and making her unable to work. 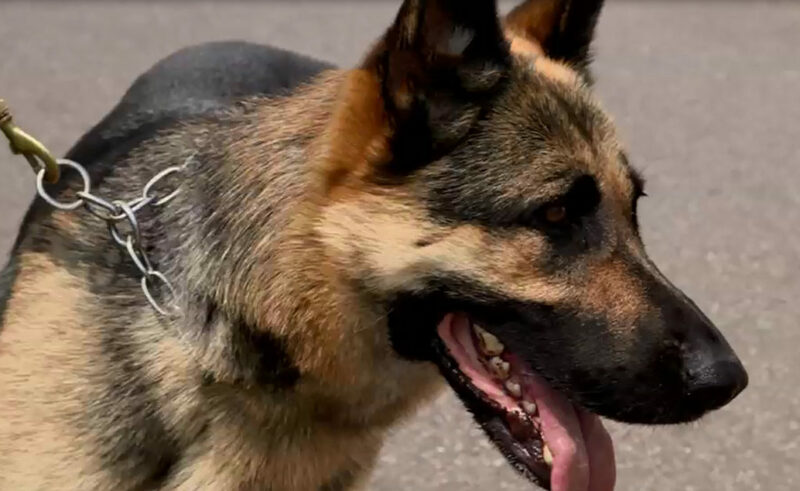 She’ll need a tricky spinal operation, which Noel has never done on a police dog- it’s not just about a quality of life- Anya needs to be at the peak of fitness if she is to return to work. The pressure is on for Noel as it’s explained to him that if she can’t return to work she’ll have to be put to sleep, as Anya cannot be rehomed as a household pet. On close examination, Noel found that not only did Anya have a right hind limb lameness, she also had bad lower back pain. This was the key problem that resulted in her being physically unable to perform her very important role. A CT and MRI scan at Fitzpatrick Referrals revealed a problem in her lower back, whereby one of her discs had dried out and as a result new bone had formed around the sides of the vertebrae. Both the bulging disc and this new bone (spondylosis) was squashing the main nerves to Anya’s back legs (sciatic nerves) and causing her significant pain. This pain was producing severe lameness and thereon an inability to function in her job in spite of painkillers. The condition is called degenerative lumbosacral stenosis. The pain she would have been in was more than anyone could have imagined, but as a resilient dog she bore it with absolute bravery. Noel performed surgery in order to relieve this pressure and then fused the affected parts of the spine to provide stability. For the past 15 years, Noel and a team of engineers have been working on a surgical treatment for this problem which involves cutting down on top of the lower spine and moving the nerves to one side, then cutting out the top and middle bit of the disc that is bulging (annulus and nucleus). Then a special screw is placed between the two vertebrae (called a FITS, Fitz intervertebral traction screw) to push them apart and to relieve the pressure on the nerves. After that some screws and clamps and special rods are placed in the vertebrae (called a Fitzateur) to hold them together forever. This procedure is called a lumbo-sacral distraction-fusion, and the aim is to get rid of the pain caused by the squashed nerves. In Anya’s case this procedure worked pretty well but then she got overly boisterous and jarred the repair before it had a chance to settle down. Because she was so determined and work-focussed, it proved difficult to hold her back to allow proper healing at home. So she was readmitted to Fitzpatrick Referrals where the team could monitor and control her healing process. Anya’s life was relying on her smooth recovery, and no one wanted to take any chances. Over the following weeks Anya underwent intensive physiotherapy and hydrotherapy and work on the agility course with the dedicated team at Fitzpatrick Referrals. Her recovery is testament to their tenacity and dedication and also to the love and huge effort put in by her mum and handler, Sian. Anya once again demonstrated the fighter within her and now thankfully she has recovered well and is back in full working condition just 5 months following surgery. I always feel truly honoured when I treat a police dog – because I am so incredibly respectful of the job that the police do in looking after society. I’m in awe of how these dogs work in extraordinary circumstances and all for trying to make society safer. Sincerely, I feel that it is my moral duty to give good advice and to do absolutely the right thing when presented with a police dog. I realise that ultimately, these dogs are athletes and they must be able to perform their function or otherwise surgery may not be the best option. I am also very aware that tax-payers money is used to support police dogs and I feel honour-bound to spend that money wisely and to give appropriate advice for the dog’s welfare and for the greater good of all dogs in the police force. The forces have a limited resource and its critical in my view to take a broad view in the interests of the dog and of the organisation. In the case of Anya, I discussed the nature of her spinal problem with the police force and we felt that it was absolutely in her best interests to continue with surgery. For me Anya was extraordinarily special because of her close bond with her handler Sian. She was as much part of Sian’s family as she was a working attack police dog, she needed to perform as an attack dog, run, jump and do her job – but also she was a much loved family member and friend to Sian. The relationship between a police dog and their handler is very special and I absolutely love when I can solve a problem and reunite this bond of companionship and co-dependence. It is so rewarding to be able to get Anya back to full working police dog fitness and it has been such a pleasure to work with her wonderful handler Sian, the really fantastic Chief Inspector Di, and of course everyone in the police force.